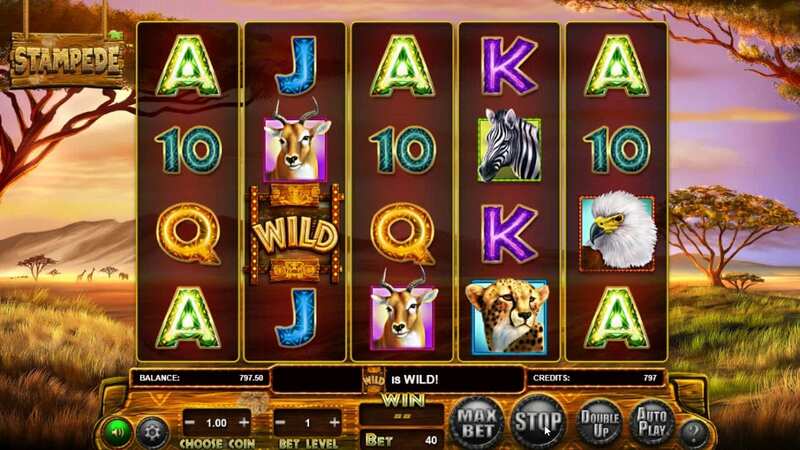 Here's a superb to play 3D slots. This wild game has a safari theme and is sure to transport you away to the vast open plains of Africa. Watch the sunset over the savannah as silhouetted wildebeest trudge along with their migration route in the distance. Keep your eyes peeled for the Big 5 such as the majestic lion and the enormous elephant. Grazing buffalo, ambling giraffes, and prowling cheetahs are also lurking in the undergrowth of the reels. 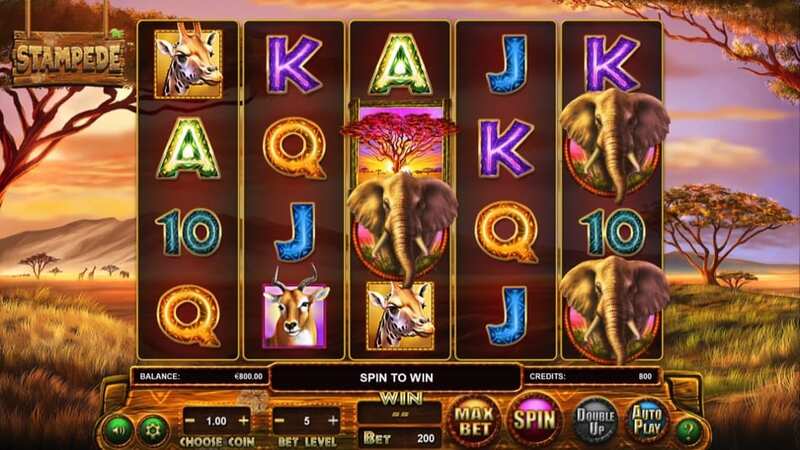 Those dreaming of an African safari, or nostalgic for a trip several years back, will not be able to resist the immersive experience provided by this fantastic slot by Eyecon. Founded in 1997 the Brisbane-based Eyecon has consistently maintained a position at the forefront of the online gaming industry, and their slots frequently feature in annual Top 10 Games of the Year lists. Their most popular slot to date – Fluffy Favourites – also has an animal theme, although the characters are more cute and cuddly than the wild animals you’ll find in Stampede Jackpot! This developer has a whole host of other games. It might be best to view our online slot games first. This is a 5 reel slot with a massive 243 fixed paylines – that’s a lot of ways to win! Players can choose a minimum bet of £0.25 and a maximum stake of £50. The slot has a RTP of 90.22%. An autoplay feature allows you to admire the plains in peace as it takes between 10 to 100 spins for you. Be sure to visit our tips page and discover more on how to enjoy the best slots when you play! 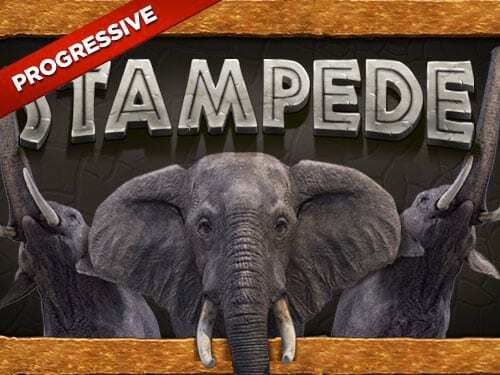 With an identical theme to the original and already popular Stampede slot, this version has the added excitement of a progressive jackpot. The radiant Sun is the Wild Symbol – it rises and sets on reels 2, 3, and 4, and can substitute in for anything other than elephant to secure you more wins. The formidable elephant is the Scatter symbol – if 3, 4, or 5 of these giants appear on your screen at any one time you will be rewarded with 5, 10, or 50 coins respectively. Whenever 3 or more elephants appear on screen you will also be rewarded with free spins and some wild multipliers! A unique feature of this slot is that allows you to choose what reward you want – 20 free games with 2x wins, 15 free games with 3x wins, 10 free games with 4x wins, 8 free games with 5x wins, or 5 free games with 10x wins! Choose carefully as you can only trigger free spins a maximum of 15 times. The three progressive jackpots (Mega, Maxi, and Mini) can be triggered at any point during the game, no matter how much you have bet. Players will love the realistic graphics that promise an immersive experience in the great African wilderness. In addition to having a great theme, you are sure to have a wild time playing this slot with fun features such as the option to choose what structure of free spins and multipliers you want. Three progressive jackpots add to the excitement. With a maximum bet of £50, this slot will appeal to high rollers, but with a minimum of 0.25 it is just as accessible to players with a lower budget. If you enjoyed Stampede Jackpot we suggest you play Doubleup Ducks Jackpot.